The value of ’straight lines’ in a retrieving dog, was questioned on the forum recently. This is an argument that comes up quite frequently in gundoggy circles. People usually make very good points. What does it matter if a dog picks his own retrieving path? Particularly on the return. Surely we don’t want to turn our dogs into robots, isn’t it better if they use their initiative? Most of us can appreciate the value of a straight and true outrun. It is usually the quickest way to the retrieve, the best way to hold a ‘mark’ and the only way to ensure that the dog can be handled effectively onto a blind. Many dogs will pick what they see as the easiest route home. This may involve running around the edge of a pond, or obstacle, rather than swimming across water or pushing through dense cover. [wp_ad_camp_1]And in many cases, the dog’s choice of route may be the quicker one. It is often faster to go around the edge of a small pond, than to swim straight across it. So what does it matter if a gundog chooses his own way back? One of our forum members explained that her trainer had told her that if her dog failed to hold a straight line in a test, this behaviour would cost her points. Understandably, a number of people questioned the wisdom of this. Surely this is just making up rules for the sake of testing? Don’t we want our working gun dogs to think for themselves. Isn’t it better, on a shoot for a dog to choose the easiest and safest place to cross a river for example? I think this is an interesting issue, and although I don’t compete, I actually fall on the side of those who do on this question. I believe that to suppose a dog is always the best judge of which is the safest route, maybe a flawed assumption. There will be times when the dog makes poor and possibly dangerous decisions. Crossing a river too close to a weir for example, or crossing where there is no exit on the far bank. Dogs tend to be good at judging the point of entry, but less adept at weighing up exit points. They also do not have our visual acuity. So if a dog starts running up and down a river bank, looking for a good place to cross, he may be more at risk than if he just returned the way you sent him. 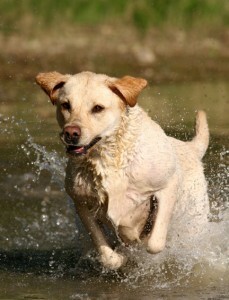 Runnning around the bank of a pond after collecting a retrieve, as opposed to swimming back across it, is extremely common in working gun dogs. As we have noted, running the bank is often a quicker way to return, dogs run a lot faster than they swim. But, there are good reasons why running the bank is considered a cardinal sin amongst many retriever trainers, especially in the USA where water features strongly in their trials and where they specifically train to avoid bank running. Insisting on straight lines out and back has its benefits. If a dog is allowed to pick his own way home on one occasion, skirting some perceived obstacle or hazard, he will no doubt do so on another occasion. It becomes a learned behaviour. A habit. The fear is, that before you know it, he’ll be skipping around every patch of daisies in his path. And if he then starts doing this on the way out (as well he might), he’ll lose his bearings and have to be handled every step of the way. So to avoid the risk of him doing this, ‘straight line’ training includes the return, as well as the outrun. Sometimes, this means going to a fair bit of trouble in your training sessions. Of course, not everyone will want to invest time in teaching their dog to line out and back nice and straight, on every retrieve. But there is logic in doing so, if you are so inclined. Even the slightest obstacle can divert a young dog, and you will need to be patient and consistent in teaching him to hold a line. A simple matter of crossing a path, or a change in topography will throw a young dog off course. Dogs being sent into a crop or similar cover will often bend their path as the hit the edge, in much the same way as light bends when it hits water. It is fascinating to watch. As long as people are aware of this tendency, they can train for it. But often, novice handlers don’t realise it’s an issue, and they inadvertently set the dog up to fail. Hi, I’ve been following these articles with great enjoyment and on most part I agree with everything written. But on this article I do find that while I agree mostly with whats written I think there is a time when a dog must have to deviate from a straight line retrieve. I work labs both on game and wildfowl. The wildfowling is on an estuary and many a time the wildfowl are dropped in tides and I have seen other dogs retrieve and try to swim against the tide only to tire and it has become a dangerous for the dog. I prefer to train my dogs to retrieve and beech with the flow then I feel the risk of tiring the dog out is greatly reduced. Thanks David, that’s an interesting point. It illustrates the need to be flexible in our training, and the importance of local knowledge, especially where water is concerned.